The Hitech 165 x 165mm 80C Filter is a color conversion filter that helps to increase the color temperature from 3800 to 5500K. The 80C allows you to use daylight-balanced film in tungsten lighting, but does not fully correct to 3200K, resulting in warmer colors when compared to an 80A or 80B filter. 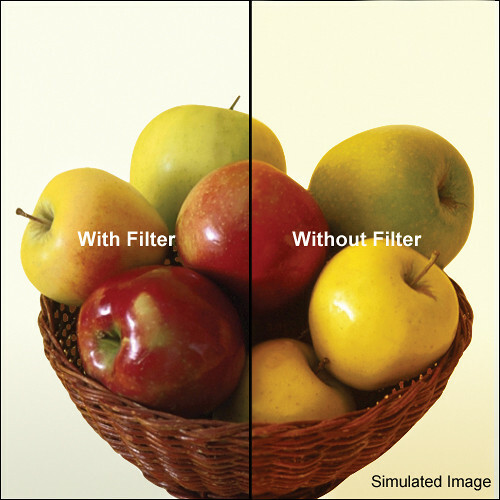 There is a 2x filter factor with this filter, requiring an increase of 1 stop for normal exposure. It measures 6.5 x 6.5" / 165 x 165mm and is constructed out of CR-39 dyed resin. This filter is compatible with the Hitech 165mm filter holder. Color conversion filter brings color temperature from 3800 to 5500K for use with daylight film in tungsten lighting situations.